Tamper evident tapes look like standard packaging tapes but have a very useful hidden benefit. 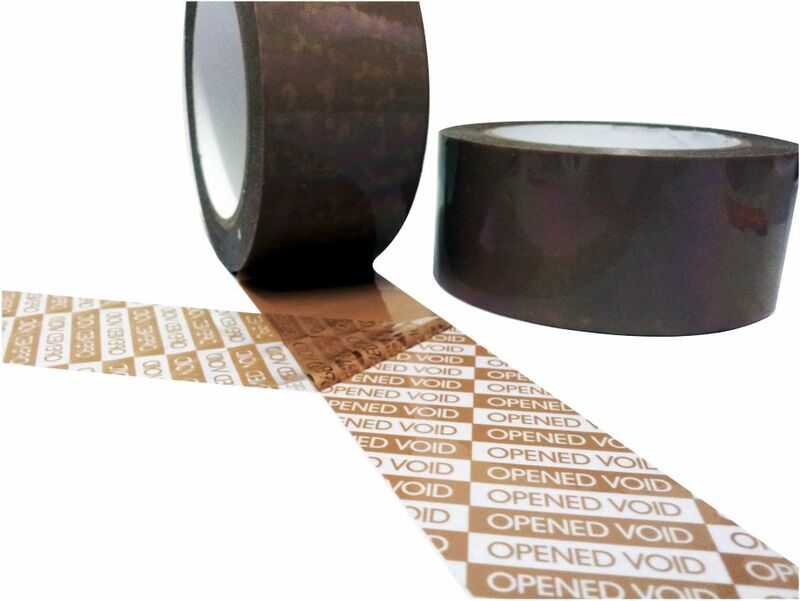 When peeling of the tape, the security tape leaves the words “VOID OPENED” on the cardboard box showing that the packing was opened unauthorised. Any attempt to replace a security tape, creates an enduring legacy of manipulation on the box, a tampering attempt is thus very difficult. This security tapes areoften used by “known consignors”, because of the obligation to secure the shipment against manipulation and access. Our security tape “VOID Premium” is an extremely high quality tape and especially designed for “known shipper”. This security tape has best properties, the prints are very easy to read on cardboard. Our security tape “Premium” is a total transfer tape and suitable for cardboard only. Tamper evident labels “VOID premium” are security labels for known consignors. These labels are of best quality, each label has a serial number. The security labels come on a roll, each label is perforated so you can remove the single labels quickly and easily. The label itself is then applied to the box manually. Unauthorised removal leaves the words “VOID OPENED” on the box. Our security tape PT is a partial transfer security tape where. When removing the tape, the text VOID or OPENED is visible on the carton. This tamper evident tape is available in red or blue colour. Tamper evident type “Standard” are favourable security tapes for sealing cardboard boxes. When peeling of the tape, these total transfer tapes leave the words “VOID” on the cardboard. Tamper evident tapes can be produced with customised text and imprints. Please send us your inquiry including your layout and the order quantity. Price: For prices on our tamper evident tapes – security tapes, please use our contact form or send us an email to info@margreiter-technik.com. Our sales team will advise you gladly!